I knew a man, called him Sandy Cane. Few folks even knew his name. But a hero, yes was he. Left a boy, came back a man. Still many just don't understand about the reasons we are free. I can't forget the look in his eyes or the tears he cried, as he said these words to me. Now, Sandy Cane is no longer here. But his words are oh so clear as they echo throughout the land. who stood the ground and took the fall to help their fellow man. Love your country and live with pride and don't forget those who died. 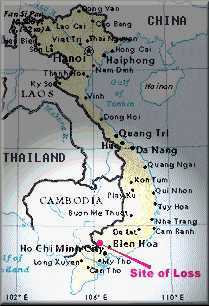 For more Vietnam War stats go here . For the Government's updated list go here . I am a Vietnam veteran. I can only hope that the citizens of this country will not let our government abandon efforts to get a full accounting of all our Missing In Action servicemen. As time marches on, issues such as our MIA's seem to fall to a lower and lower position on Uncle Sam's "to do" list. Our freedom is the most precious thing we have, personally and as a nation. 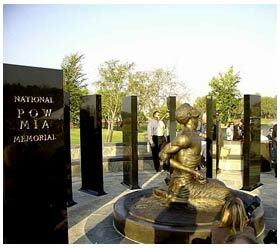 We are fortunate enough to live in the greatest country in the world and we should never forget those who have paid the ultimate price and those that may still be alive in southeast Asia. 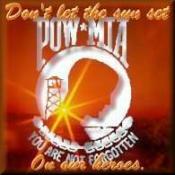 We must make sure the young people of today are made aware of the POW/MIA issue. There are many informative and inspiring sites that address this subject and others. Please look over the list of links to other sites, then load and learn. Thanks. I believe in the United States of America as a Government of the people, by the people, for the people; whose just powers are derived from the consent of the governed; a democracy in a republic, a sovereign Nation of many sovereign States; a perfect Union one and inseparable; established upon those principles of freedom, equality, justice and humanity for which American patriots sacrificed their lives and fortunes. I therefore believe it is my duty to my country to love it, to support its Constitution, to obey its laws, to respect its flag, and to defend it against all enemies. I'm looking for information on my MIA. I've checked his hometown newspaper and several on line databases with no luck. If you know him or somewhere I can get a photo, newspaper account or other information please email me. Thanks. From John D. Dennison: "Upon my arrival to HHC 1st Bn. 8th Cav, I heard about a fellow medic who became missing after being wounded during a tactical operation with the 11th Armor Cav. 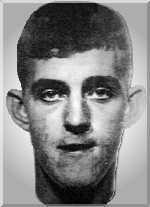 His name was Randall Shelley Ellis. It was speculated by fellow medics that Ellis had either fallen asleep or passed out by the LZ and was taken prisoner before anyone realized that he was missing. A few months later another medic was missing while his unit was working with the 11th Armor Cav. He was later found. He had gone to a hospital in an APC with a wounded solder from the 11 Armor Cav. It's not hard to have people come up missing in a combined operation involving armor and infantry when contact is made with the enemy. The infantry rides on top of tanks and APCs, but when contact is made, the infantry will disembark from the armored vehicles and try to take a tactical position if possible. The tanks and the APC's will do the fighting while grunts dodge the vehicles. As you can imagine, grunts are scattered all over the battlefield attempting to take cover and dodging the armor vehicles while trying to engage the enemy." Source: Compiled from one or more of the following: raw data from U.S. Government agency sources, correspondence with POW/MIA families, published sources, interviews. 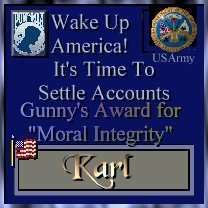 Updated by the POW NETWORK in 1998. On April 18, 1969, SP4 Ellis was serving as a medic for HHQ, 1st Battalion, 8th Cavalry. His unit was on a combat mission in South Vietnam, operating in a tank infantry formation when one of the tanks was hit by a rocket propelled grenade (RPG), causing casualties. Ellis responded immediately, and as he climbed aboard the tank, sniper fire wounded him in the left hand. He was taken to a medivac landing zone to be taken to a medical aid station. He was seen by several different people at the LZ. Whether Ellis ever boarded a medivac dust off helicopter was never determined.No one ever saw him again. The area was cleared and searched twice that day and again the following day. A company-sized sweep was conducted but nothing was found. All medical facilities in the country and some out of the country were queried about SP4 Ellis, but no information regarding his fate was reported. Ellis is among some 3000 Americans whose fate remained uncertain at the end of American involvement in Vietnam. Since 1975, that number has dwindled to around 2400 due to case resolution, and return and identification of remains. Incredibly, when Vietnamese refugees began to flood the world, they brought with them stories of Americans still held in their country as prisoners of war. By 1989, the number of these reports had almost reached the number of 10,000. The quality of these reports has been deemed very high, as less than 20% of the total have been determined to be fabricated. Families of the missing are taunted by reports that men are alive, captives of our long-ago enemy, while the U.S. seems unable to do what is necessary to bring these men home. If still alive, some MIA's are now in their 70's. They don't have much time left. PLEASE take a moment to write your Congressman, Senator, and the Whitehouse. Check here for progress on Congressional legislation dealing with the POW/MIA issue. Type in POW/MIA in the Search box at the top of the page. 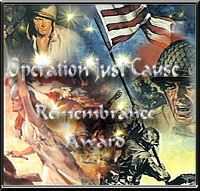 * All Biographical and loss information on POWs provided by Operation Just Cause have been supplied by Chuck and Mary Schantag of POWNET. Please check with POWNET regularly for updates. WITH LIBERTY AND JUSTICE FOR ALL ... My allegiance is to Liberty, to Justice. My flag represents the best of myself, my effort, my home, my country. I will pledge allegiance to the flag. I will pledge under the love of God. It is my right, my privilege, my duty, I have earned it. Tell me not how! I have given you much. I am a Former Prisoner Of War. Take nothing more from me. Is this a time to reflect or a reflection of the times? "I hope we never get into another war." I hear it all the time when a group of guys my age get together and talk politics. 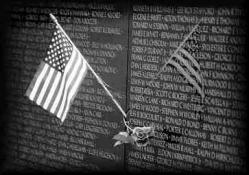 Most of us are veterans, many are Vietnam vets. "I guess we'll have to go. These young people today won't go and fight." The heads nod in agreement. It sounds so gung-ho and makes us feel good, but the idea of a bunch of 50-something's marching off to war soon brings us back to reality. What bothers me the most is the fear that many of the younger generation have lost the Spirit of Patriotism and what it means to be an American. Perhaps this is the price we have paid for "peace in our time". I would hope that the Americans of today would not have to live in a country at war to re-kindle the embers of Patriotism. Would I feel as I do about our nation if I had not grown up in the 50's and 60's, in the eras of the Korean and Vietnam wars? I can only hope that I would. How can we pass on the flame of Patriotism and pride many of us feel for our country? I talk to the young people I know and tell them of my experiences and how I feel about our country. I try to explain that our freedom is not a gift, but a legacy left to them by the thousands of veterans who have fought and sacrificed in all the wars our nation has been involved in. We all accept our freedom as a birth right. But doesn't this freedom have a price tag? You bet it does! When I went to the "Wall" last Thanksgiving, I was looking for the name of my adopted MIA. I finally found it on one of the lower lines of the panel. I had to get down on my knees to touch it. When I went to get up, I looked to the left, the right and above me. All I saw were all those names. The enormity of the price we had paid and 30 years of pent up emotions got the best of me. We could force people to be "patriotic" by re instituting the draft. I personally think it wouldn't be such a bad idea. Is two years of service to our country too severe a price to pay to live here? But in these days of political correctness and God forbid, "hurting someone's feelings" this is probably not going to happen. I think the only other solution is education. Educate our kids about our history, why we have Veteran's Day and Memorial Day. 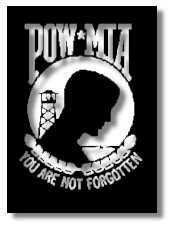 Explain why the POW/MIA issue is important. Why we cannot let the government sweep the memory of these patriots under the rug. Only through knowledge will the legacy of those who have gone before us insure the freedom of those to come. I think it is about time to update this article. A lot has happened in the world since I originally wrote this for the Moonduster Chronicles. This generation now has its Pearl Harbor... 9/11. I am proud of the many young people who immediately volunteered to join the military and fight the War on Terror and to the many who still enlist and keep us safe at home. Although my opinion of many young people is the same, the ones who enlist in the military have earned my utmost respect and support. They are a credit to their country and gerneration. For those who have paid the ultimate price, there are no words I can say to express my gratitude for their sacrifice except a most heartfelt "Thank you". As long as terrorists threaten our country and way of life, I am sure many of the younger generation will continue to answer the call as have the generations before them. The Sailors, Soldiers, Airmen, Marines and Coastguardsmen of today do not have to take a backseat to any of those that have served before them. I salute all who have served, are serving and will serve in the future. Here it is 14 years later and am updating this page again. As the draw down in Afghanistan concludes and most of the troops in Iraq have redeployed, I just wanted to mention the pride I have in the U.S. military. They have served honorably and many have died or have been maimed. 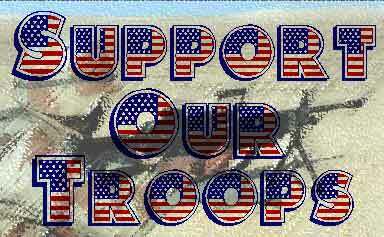 I hope as a country, we do OUR duty and give these returning servicemen and women the help they need and have earned. I know many Vietnam vets who are still trying to get claims approved for Agent Orange and other disabilities. We cannot allow this to happen to today's veterans. It is OUR responsibility to take care of these people. They did THEIR duty, now we have to do OURS. Press the Button and go to the OJC page you want. those named on the Vietnam Veterans Memorial in Washington, DC.